Rosetta arrived at Comet 67P/Churyumov-Gerasimenko on 6 August 2014, and after an initial survey and selection of a landing site, Philae was delivered to the surface on 12 November. After touching down in the Agilkia region as planned, Philae did not secure itself to the comet, and it bounced to a new location in Abydos. 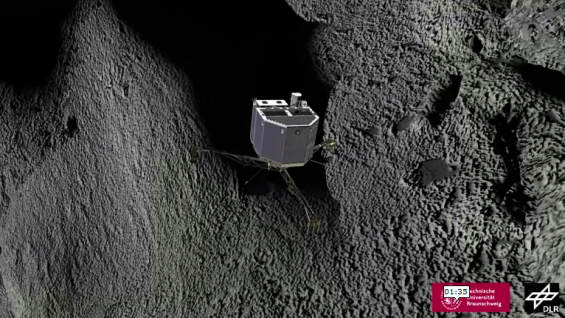 Its flight across the surface is depicted in a new animation, using data collected by Rosetta and Philae to reconstruct the lander's rotation and attitude. Then, on landing, the harpoons themselves did not fire. "It seems that the problem was either with the four 'bridge wires' taking current to ignite the explosive that triggers the harpoons, or the explosive itself, which may have degraded over time," explains Stephan Ulamec, Philae lander manager at the DLR German Aerospace Center. "In any case, if we can regain contact with Philae, we might consider an attempt to retry the firing." Despite the unplanned bouncing, Philae completed 80% of its planned first science sequence before falling into hibernation in the early hours of 15 November when the primary battery was exhausted. There was not enough sunlight in Philae's final location at Abydos to charge the secondary batteries and continue science measurements. However, over the past few weeks, with the comet's activity now subsiding, Rosetta has started to approach again. This week it reached 200 km, the limit for making good contact with Philae, and today it dips to within 170 km. "We had already determined that one of Philae's two receivers and one of the two transmitters were likely no longer working," says Koen Geurts, Philae's technical manager at DLR's Lander Control Centre in Cologne, Germany, "and it now seems that the other transmitter is suffering problems. Sometimes it did not switch on as expected, or it switched off too early, meaning that we likely missed possible contacts." The team is taking this new information into account to determine the most promising strategy to regain regular contact. But it's a race against time: with the comet now heading out beyond the orbit of Mars, temperatures are falling. "We think we have until the end of January before the lander's internal temperature gets too cold to operate: it cannot work below -51°C," adds Koen. Meanwhile, Rosetta continues to return unique data with its suite of instruments, analysing changes to the comet's surface, atmosphere and plasma environment in incredible detail. 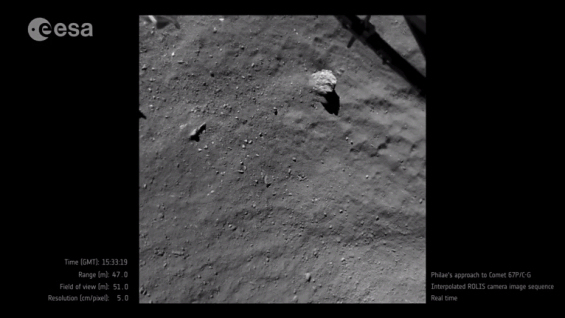 "We recently celebrated our first year at the comet and we are looking forward to the scientific discoveries the next year will bring," says Matt Taylor, ESA's Rosetta project scientist. "Next year, we plan to do another far excursion, this time through the comet's tail and out to 2000 km. To complement that, we hope to make some very close flybys towards the end of the mission, as we prepare to put the orbiter down on the comet." The plan is to end the mission with a 'controlled impact' of Rosetta on the surface. This idea emerged around six months ago, when an extension of operations from December 2015 to September 2016 was announced. The Rosetta teams are now investigating the manoeuvres needed for operating close to the comet in the weeks leading up to the dramatic mission finale. "We are still discussing exactly what the final end of mission scenario will involve," says Sylvain Lodiot, ESA's Rosetta spacecraft operations manager. "It is very complex and challenging, even more so even than the lander delivery trajectory our flight dynamics teams had to plan for delivering Philae. "The schedule we're looking at would first involve a move into highly elliptical orbits – perhaps as low as 1 km – in August, before moving out to a more distant point for a final approach that will set Rosetta on a slow collision course with the comet at the end of September." It is expected that science observations would continue throughout and up to almost the end of mission, allowing Rosetta's instruments to gather unique data at unprecedentedly close distances. "We'll control Rosetta all the way down to the end, but once on the surface it will be highly improbable that we'll be able to 'speak' to it anymore," adds Sylvain. "Landing Rosetta on a comet will be a fitting ending to this incredible mission," says Patrick Martin, ESA's Rosetta mission manager. Rosetta is an ESA mission with contributions from its Member States and NASA. Rosetta's Philae lander was provided by a consortium led by DLR, MPS, CNES and ASI.